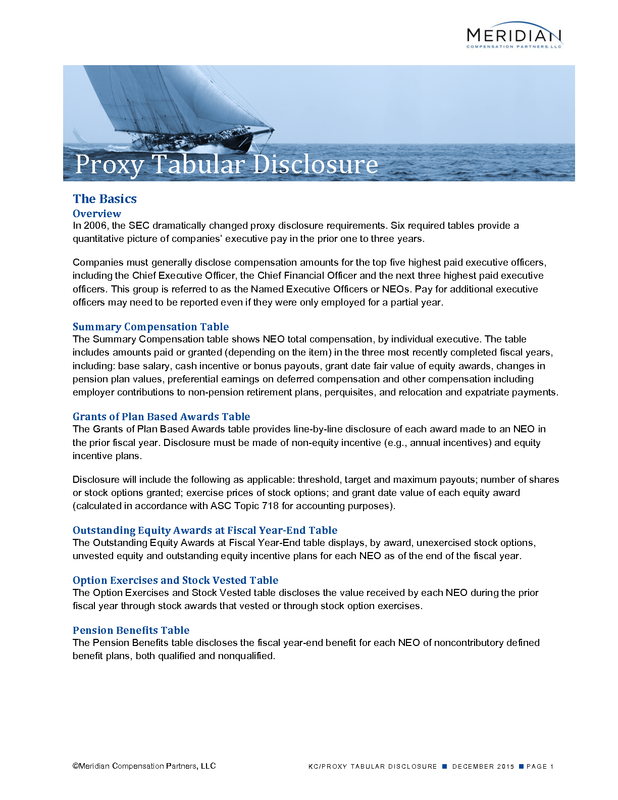 Meridian explains tabular disclosures required in proxies, with annotated examples. In 2006, the SEC dramatically changed proxy disclosure requirements. Six required tables provide a quantitative picture of companies’ executive pay in the prior one to three years. Companies must generally disclose compensation amounts for the top five highest paid executive officers, including the Chief Executive Officer, the Chief Financial Officer and the next three highest paid executive officers. This group is referred to as the Named Executive Officers or NEOs. Pay for additional executive officers may need to be reported even if they were only employed for a partial year. The Summary Compensation table shows NEO total compensation, by individual executive. The table includes amounts paid or granted (depending on the item) in the three most recently completed fiscal years, including: base salary, cash incentive or bonus payouts, grant date fair value of equity awards, changes in pension plan values, preferential earnings on deferred compensation and other compensation including employer contributions to non-pension retirement plans, perquisites, and relocation and expatriate payments. The Grants of Plan Based Awards table provides line-by-line disclosure of each award made to an NEO in the prior fiscal year. Disclosure must be made of non-equity incentive (e.g., annual incentives) and equity incentive plans. Disclosure will include the following as applicable: threshold, target and maximum payouts; number of shares or stock options granted; exercise prices of stock options; and grant date value of each equity award (calculated in accordance with ASC Topic 718 for accounting purposes). The Outstanding Equity Awards at Fiscal Year-End table displays, by award, unexercised stock options, unvested equity and outstanding equity incentive plans for each NEO as of the end of the fiscal year. The Option Exercises and Stock Vested table discloses the value received by each NEO during the prior fiscal year through stock awards that vested or through stock option exercises. The Pension Benefits table discloses the fiscal year-end benefit for each NEO of noncontributory defined benefit plans, both qualified and nonqualified. The Nonqualified Deferred Compensation table provides information related to the NEO’s participation in all nonqualified defined contribution plans or other nonqualified deferred compensation arrangements during the most recently completed fiscal year. The table includes information on the executive’s contributions, company’s contributions, aggregate fiscal earnings and withdrawals/distributions and aggregate balance for each plan. While there is no prescribed format to disclose Potential Payments Upon Termination or Change-in-Control, the rules have evolved through SEC comment letters to essentially require showing the total amount each NEO would potentially receive upon various types of termination events, including a change in control, in their component parts such as cash severance, equity vesting, excise tax gross-ups and other benefits. In May 2015, the SEC approved a proposed rule that would require a public company to disclose the relationship between executive compensation “actually paid” and the financial performance of the company. Under the proposed rule, an issuer would be required to make a tabular disclosure showing prescribed compensation information for its CEO and other NEOs. Meridian’s summary of the proposed rule is currently available under News & Alerts. We will provide more detail on the tabular disclosure once the rule is final. The Summary Compensation table shows total compensation for each NEO. The table includes amounts paid or granted (depending on the item) in the three most recently completed fiscal years. The Grants of Plan Based Awards table provides the detail shown below. Grant dates need only be shown for equity awards. The Outstanding Equity Awards table displays the unexercised stock options, unvested equity and outstanding equity incentive plans for each NEO as of the end of the company’s fiscal year. This disclosure is made on an award-by-award basis. The Option Exercises and Stock Vested table discloses the value received by each NEO during the most recently completed fiscal year for stock awards that vested, as well as the value realized upon stock option exercises. The Pension Benefits table discloses noncontributory defined benefit plan balances, both qualified and nonqualified.